The living room space was one of the main attractions to the house we bought around 2.5 years ago. Light filled with high ceilings and, by our standards coming from Seattle, it was a really large space that would allow some of our nicer furniture to stand out and shine instead of being puzzle-piece-crammed into smaller rooms like we’d done in previous houses. After moving in, we found plans dating back multiple owners that showed the room, along with the dining room and Isabelle’s bedroom, being built as a master suite addition. But we believe the chef that took over the living room as a second kitchen instead turned it into the living room, dining room, and bath/dark room combo that we purchased. Overall, it was a space that didn’t require a ton of work beyond a careful coat of fresh paint but did need some odd fixes. To do’s included: finishing a section of the hardwood floor between the living room and dining room (it was an open threshold gap); removing dated light fixtures and moving the chandelier to the dining room; installing a smaller, more casual chandelier; covering/repairing many holes in the ceiling from removed ceiling fan, speakers, and ceiling mount canned lighting; removing tacky roller shades; and deciphering why there was a 10″ wide 6-switch light panel for the former assortment of removed fixtures. Within a few weeks of moving in, we’d solved the paint, floor repair, removal of french doors (they were re-purposed to a bedroom), and replaced two of the canned lights with recessed, higher quality that allow you to move the beam in order to highlight art versus just added flood light. the quality of them and the expense given the so-so look. They looked fake both in finish and form. So after a bit of thinking, I came up with the idea to use real, solid wood to create my own faux beam. My contractor, Seth Branum, set out to find 4″ x 8″ beams in as long a length as possible. Not surprising, the lengths topped out at 12′ which led to the next problem of how to mask the seams that would be visible between the pieces. We’d been working on the refrigerator surround (featured in NQM House Tour: Modern Farmhouse Kitchen) so it occurred to me to have the same iron smith (that finished the fridge) create U-shaped brackets to cover each end of the beam as well as the seam at the center of the room. She finished the iron in a deep gold/bronze color and we selected extra long un-lacquered brass screws to attach the beam as well as trim out the brackets. Next, Branum stain matched the wood to the existing wood in the room, and devised an anchor system that was strong enough to support the weight of the wood. A few months after moving in, it took 3 strong contractors the better part of a day to install them but we are so happy with the results! A multitude of sins hidden and a nice touch to the feel of the room taking it a bit farther from 70’s ranch to the updated farm house feel we are wishing for. About 7 months after we’d moved, spring rolled around we discovered why they had the tacky roller shades: the room got baking hot in the bright sunshine. 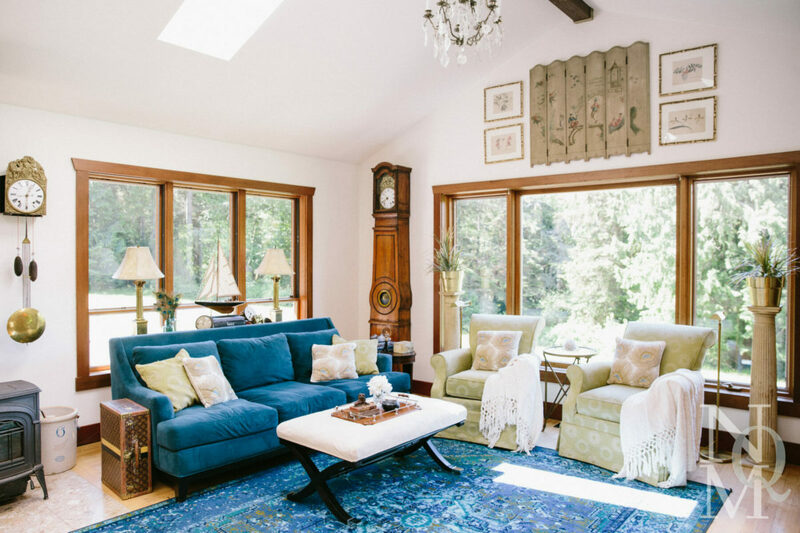 We debated about window covering options and although I’m personally a big fan of custom floor to ceiling curtains, it felt like the room should have bare windows. So we solved the problem with outside solar powered sunshades. All of the furnishing you see we owned before hand. Our previous Seattle older craftsman/farmhouse had a small living room so we’d used a love seat and the green chairs in it, but this room needed a full size couch so we shifted a den couch here and gave the love seat away. The rug was the only big impact purchase in order to tie the chairs and couch together into a cohesive color scheme. Because we were spending so much on the remodel, we opted for an inexpensive, under $500 online 9′ x 12′ rug that would survive a toddler and multiple pets. Beyond the rug, we only added a few new touches like throw blankets and pillows to finish the room up. I often mix up the accessories and add things to the decor through estate sales and Craig’s List. A few of the items you see were found on local Yahoo mom’s groups—the Alexa Hampton Austin Bench by Hickory that retailed for over $2,000 was a size and fabric choice error by another Seattle mom that I snapped up for a fraction of the retail. With a simple slipcover it makes a perfect ottoman for us to put our feet on while we watch TV. And while I favor antiques and vintage items, it’s my norm to take those ‘high’ items and mix them in with ‘lows’ from Target, Nordstrom at Home, Anthropology and other retailers. I love switching things up seasonally (this is my spring/summer look) and have found that you never know where you’ll find great bargains! On the note of liking to switch things out, we are currently in process of redecorating this space. Crazy? Well, maybe but the bargain rug I mentioned didn’t hold up well and without it, the current look doesn’t work well. After 2.5 years, the rug binding is worn and the overall finish (which was only so-so to begin with) has suffered a lot and now looks very cheap. I shopped a bit for a replacement but, my tastes being what they are, I kept finding rugs that worked yet had prices comparable to used cars. Given our priorities of other house projects, Isabelle’s college fund as well as investing in No Qualms Mom, this is just not in our budget at the moment. So, with the dreaded budget in mind, I did my favorite shop from what you own game and remembered a lovely coral-toned Persian rug that was in storage. I bought it as a splurge while living in Europe and am basing the new living room design off of it. I plan to swap the teal couch with one we have in our den as well as adjust other items we already own. My goal is to redecorate for less than $150! I’ll keep you posted on the results. Photo by Angela Carlyle: Venetian mask is a souvenir from a vacation years ago, Chinoiserie antique clock was found at a flea market in France. Photo by Angela Carlyle: Antique armoire purchased in one of the wonderful antique stores in Metz, France holds our flat screen TV, the oil painting was purchased from an artist in Rome and framed locally. Both the etchings were found at a Paris antique show and the sunburst mirror was found in Nancy, France. The stool is one of a pair and was found at a flea market in Metz and reupholstered. Photo by Angela Carlyle: Entry table holds a mix of new and old, high and low. Photo by Angela Carlyle: Antique paper mache tray holds small treasures including an academic medal from Bausch and Lomb that my mother won for science in high school.